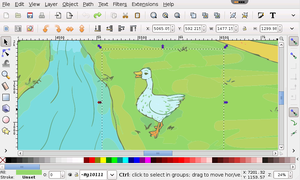 Inkscape is a drawing and painting tool, professional vector graphics editor similar to Adobe Illustrator or Corel Draw but with features, new tools, and interface style of its own. It emphasizes the W3C standard Scalable Vector Graphics (SVG) file format, but reads and writes a wealth of other formats including PDF, so it is an easy complement to your other graphics and desktop tools. 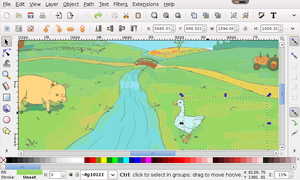 Inkscape online has lots of features facilities for objects creation and manipulation, fill and stroke, rendering, text editing and operations on path. 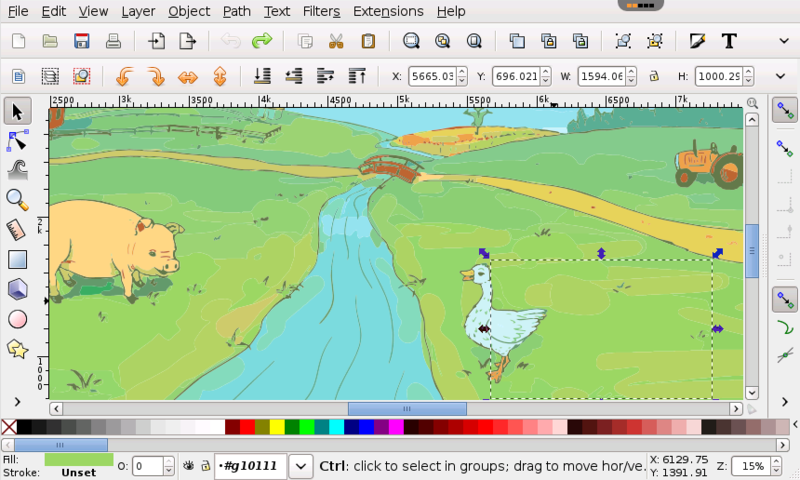 This graphic online editor has a lot of features for drawing (pencil, pen, calligraphy tool), working with shape tools, text tool, object manipulation (transformations, grouping objects, layers). It has color selector and picker tool, color editor, gradient editor, node editing, fully anti-aliased display, creation of vector art from bitmaps, sprites, and icons and more. 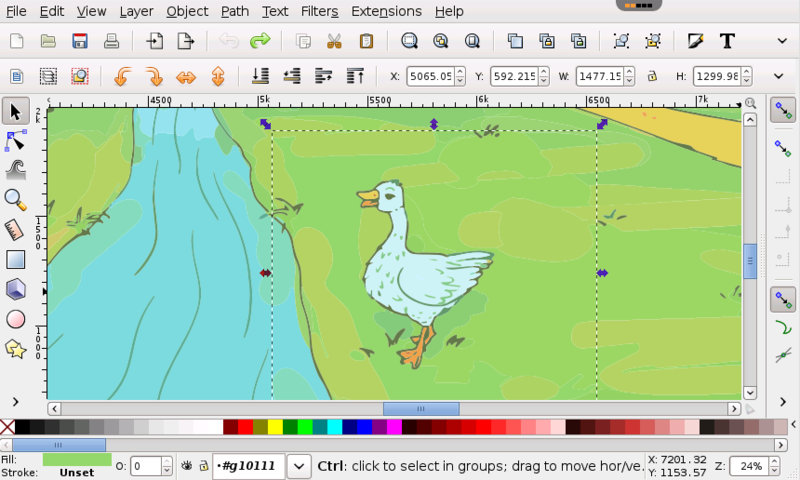 Inkscape as a photo online editor like Photoshop enables you to edit your photography with filters, different effects, and other features but with no download. This is especially important for Chrombooks. With rollApp you can work with your files from Dropbox, Google Drive, and save them to these and other cloud storage. Well, Inkscape can be used if you are patient, but I did not find a way to save the file to my PC. This is a great service and can help Inkscape gain more traction with new users using this model. Users can first try online and if they really like the app they can download and install on their own machine. Thank you very much for making this happen! Amazing. Sometimes doesn't work properly... But in some situations it's quite useful. 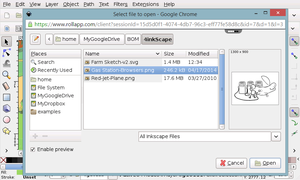 I normally love inkscape - but Rollapp turns it into a slow, unwieldy tool - and without local file I/O, it's not a lot of use. I am not able to get anywhere on this app. Every time I use the text button, the entire app goes glitchy and I have to shut it down and start over. For example, when I type a word and hit space bar, 100 spaces appear. Then all the buttons start flashing. No good. Looking for another drawing app. This is well done on importing to here, it's just that the lag on here is too unbearable for me to use. Plus common commands like CTRL+SHIFT+L or CTRL+Scroll do not work well with browsers. Amazing to have Inkscape on a Chromebook! (Acer C720P) Complex Inkscape file loaded fast, and editing it was surprisingly smooth. Using "RollApp File Opener" (from Chrome Web Store) to re-open saved Inkscape files from Dropbox (doesn't work with GoogleDrive as of this writing) worked like a charm, automatically opening the file in Inkscape. To enlarge teeny initial Inkscape window, click little square icon toward upper right (dragging lower right doesn't work). fix the window so it doesn't start up so small! not connect working....pl come connect me work..
Like it. 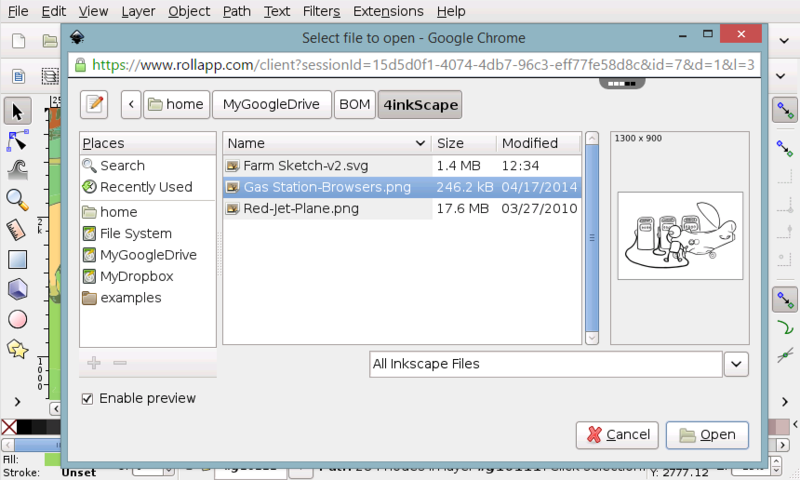 I use a Chromebook and was unable to use Inkscape until I found rollapp.com - Thanks! It's nice to have an application like this available online, but I found myself unable to resize the window at all. Whenever I tried to resize it, it went back to the previous size, which I found a bit annoying. It's a brilliant idea to have this heavy stuff work online ;) I like it.